Since throwing off the shackles of British colonialism in 1957, the maritime Southeast Asian nation of Malaysia has grappled with a colonial legacy that divided political and economic power along ethnoracial lines. The nation has functioned primarily as a multi-party ethnocracy. Dominant political parties initially formed around ethnic boundaries drawn during the colonial era claim to represent the interests of the country's three largest constituent groups: Malay, Chinese, and Indian. The political parties representing minority groups officially designated "non-native" abide by a nation-founding principle of recognizing the "special rights" of the native Malay majority. In the aftermath of the 1969 Kuala Lumpur ethnic riots, Malay policies of "positive discrimination" instituted under the United Malay National Organisation (the ruling party) affirmed Malay as the national language, Islamic culture (the religion of a majority of Malays) as the national culture, and literature in Malay as the national literature. Economic and education policies ensured quotas for Malays in schools and government services while providing advantages to Malays in business development in an attempt to redress the economic inequity of the colonial era that disproportionately benefited Chinese immigrant and settler communities. These policies eroded state support for Chinese-language (or Sinophone) vernacular education and media. While promoting itself as a "harmonious" and "truly Asian" multicultural society, Malaysia has officially codified a racialized hierarchy into its national framework. Despite this official framing, and despite the lack of recognition by the state, Malaysian cultural production--including literature, cinema, popular music, and other media--has remained a vibrant multilingual enterprise, even if non-Malay forms must access unofficial channels outside the mainstream for broad dissemination. 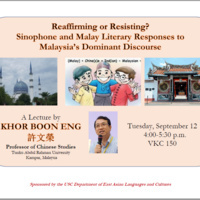 In this talk, Prof. Khor Boon Eng, a preeminent trilingual scholar of Malaysian literature from the Malaysian university that bears the namesake of Malaysia's first prime minister, compares how Malaysian authors who write in Malay and those who write in Chinese respond to the dominant discourse of ethnocracy in Malaysia. Given that Malay and Sinophone Malaysian authors rarely communicate and acknowledge each other's work--and that scholarship on the two traditions remains largely segregated--this talk offers a rare opportunity to observe how two vibrant literary and cultural traditions comparably partake of the same multicultural space. Khor Boon Eng is Professor of Chinese Studies at Tunku Abdul Rahman University in Kampar, Perak, Malaysia. He has authored, edited, or co-edited a total of nine books in Chinese and Malay, including A Study of Malaysian Chinese Literary Types and Forms (2014), The Third Cultural Space: Malaysian Chinese Literature (2014), Uproar in the South: The Poetics of Political Resistance in Sinophone Malaysian Literature (2009), and As Far South as the Eye Can See: Sinophone Malaysian Cultural and Literary Discourse (2001).